I visited my favorite village open air market (Cho An Trach) today and did some shopping, chatting, catching up with the vendors and taking a few photographs of the people and produce. When I walked around the market many people knew me from prior visits and I recognized many of them. I bought meat and some vegetables from different people. 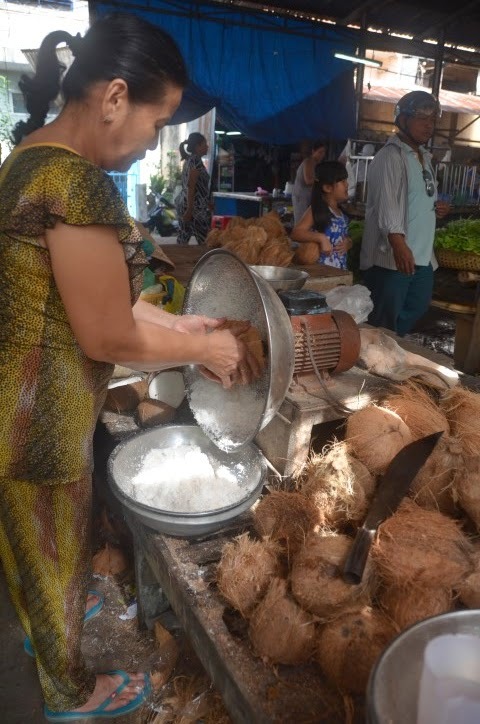 One woman has a machine to grate the mature coconuts to fine shreds. I asked her to shred 2 large coconuts for me and I will return at the end of my shopping to get it. When I returned she has a large bag sitting near her work station. For less than 1 USD I was able to purchase freshly shredded coconut. It would have taken me quite a long time to shred it by hand. It's about 90 degrees F during the day here in Nga Ba An Trach (Vietnam) and ice cream seems to be a fitting cold item that is hard to find. I decided to make coconut and pandan leaf ice cream. My aunt helped me harvest some fresh pandan leaves (known as la dua in Vietnamese) from the back yard. 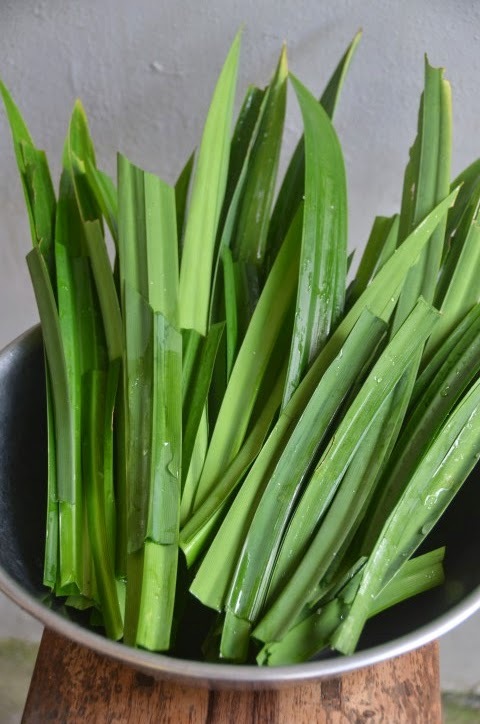 Pandan leaves have a very nice aroma and it's often used in desserts. The extracted leaves are used in parts of Asia similar to vanilla. I remember my father used to add a few leaves when he cooks rice so our rice has a beautiful fragrance. In the States one can buy either the extracted liquid in a bottle or frozen leaves in some Asian markets. I prefer the frozen leaves over the liquid since I find this to be higher quality. Mix the water into the shredded coconut. Massage with your hands to incorporate the 2 ingredients well. Either use your hands or cheese cloth to squeeze as much liquid out as possible. Save the dry coconut shreds for a second batch. Mix the water into the dry coconut shred. Massage with your hands to incorporate the 2 ingredients well. Either use your hands or cheese cloth to squeeze as much liquid out as possible. Discard the dry coconut shreds. 1) Cut the pandan leaves into about 1-inch lengths. 2) Place the cut leaves and water in a blender and puree to shred. 3) Squeeze the juice out either with your hands or cheese cloth. Save the juice or extract and discard the pulp. 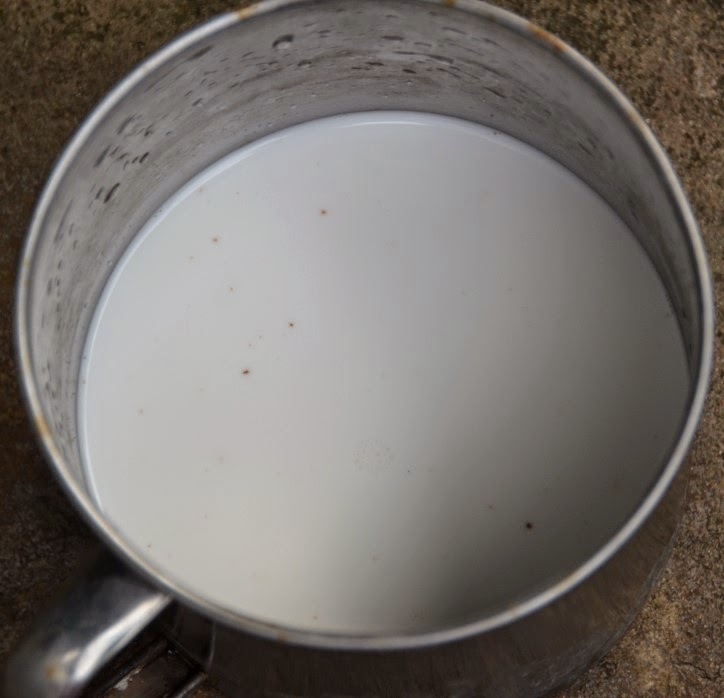 *It is best to use as little water as possible to extract the coconut milk and pandan leaves. I was using an old blender and it was difficult to use less water to puree or shred the pandan leaves. *I did not have any cheese cloth so I used my hands to extract the liquid. If you use a cheese cloth then you will probably get more liquid. 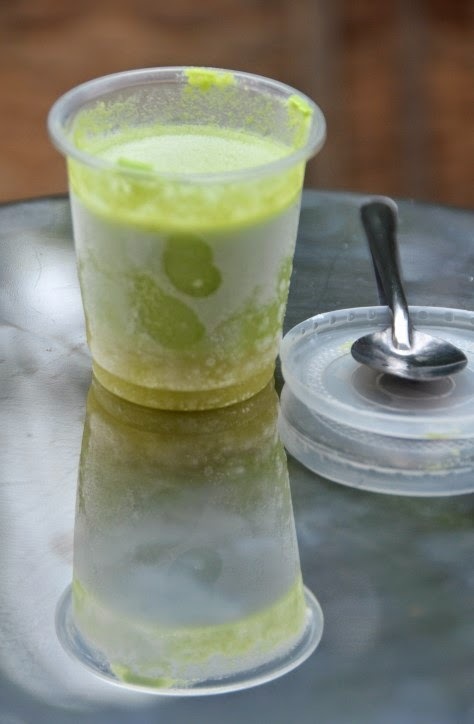 1) Heat coconut milk, pandan leaf extract and condense milk in a pot over low heat. Stir occasionally and let it gently simmer for about 5 minutes. Remove from heat. 2) In a medium sized bowl add eggs and whisk them with a fork until well blended. 3) Stir the egg while adding a ladle of the hot liquid to temper the ingredients. Continue the same process for the next few ladles until the liquid is hot. Pour the bowl into the pot and stir. 4) Let the contents cooled and pour into a container to be stored in a refrigerator to chill. 5) Once the liquid is chilled, pour this into an ice cream maker and follow the manufacturer's instruction. 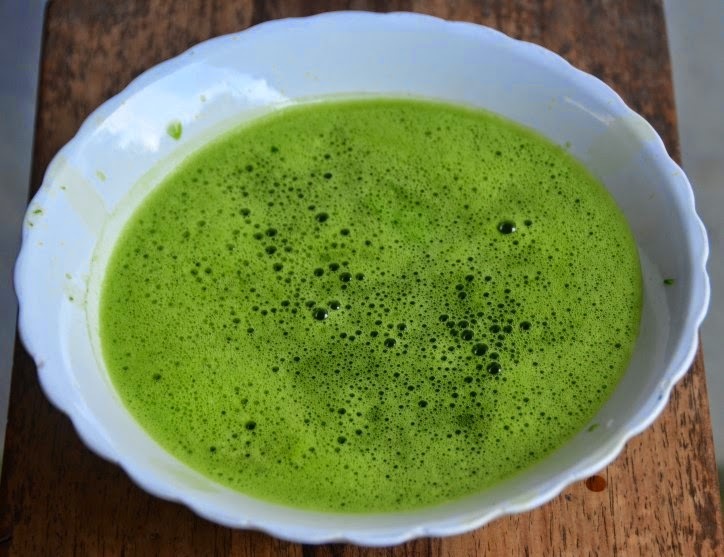 *I really like the fragrance of pandan leaf extract so I used quite a bit for this recipe. If you prefer less then use 1/2 a cup instead. Also I did not make this too sweet. Add more condense milk for sweeter ice cream. *I gave the ice cream to my aunts, uncles, cousins, and nephew to try. The adults like this recipe. The children did not like it because the pandan taste was too strong and it was not sweet enough.